Conclusion – Should You Buy The Behringer C-1? 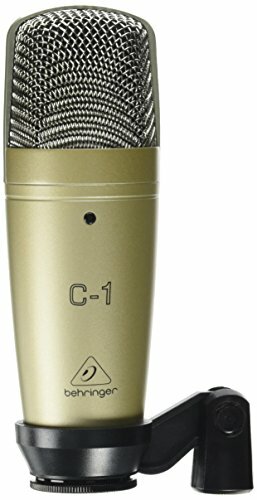 Anyone who needs a studio quality condenser microphone will walk away impressed with the Behringer C-1. This is a microphone that offers exceptional performance while still being available at a reasonable price. The appeal of this microphone has to do with the amazing amount of features combined with the sensible price. This professional microphone can work well for both recording purposes and for live performances. Most condenser microphones are going to be more commonly used in the studio than in a live setting, but this is a fairly versatile microphone. It wouldn’t be too unusual to see someone using a high-quality microphone like this for a speech or other types of live applications. Regardless, the most common use will be for recording audio at a very high level. You can limit outside noise while capturing the crisp audio that you are looking for. It will be perfect for recording vocal performances and should also work brilliantly for recording acoustic instruments. This microphone is sensitive enough to pick up small noises, which makes it great for recording acoustic guitars and other subtle sounds. By using this microphone, it will be possible to get the best results when recording. The biggest demographic for this microphone will be those who are recording music. A condenser microphone like this is going to be especially handy for those who are recording acoustic music. You will be able to capture the quieter sounds that just won’t show up as clearly when using other types of microphones. It makes it so that your recording can turn out as brilliantly as possible. There are applications for this microphone outside of the realm of music, too. People regularly use microphones such as this to record audio for voice overs, and it has proven to be a popular option for podcasting, as well. There are many people out there who are creating content in their spare time. Video sharing over social media has allowed people to create a platform for themselves, so having a quality microphone for recording like this has a broad appeal. Musicians will be the people who buy condenser microphones most often, though. You can capture a very robust sound when using a microphone of this quality. It isn’t very expensive, but it is still able to produce remarkable results. This is going to appeal to anyone who needs a professional quality condenser microphone that doesn’t cost an exorbitant sum of money. When you open your box, you will find one Behringer C-1 condenser studio microphone. Your package will also contain a handy carrying case, a swivel stand mount, and a user’s manual. The carrying case should prove to be quite useful if you plan on taking this with you to different locations. It is built to be quite rugged, but it is still smart to use caution when handling equipment like this. The swivel stand mount will be simple to use, too. It will allow you to affix the microphone properly in a studio setting. This makes it easy to get it where it needs to go, and you will not need to worry about going out to buy other hardware. The fact that it comes with the microphone is definitely a benefit. The features of this condenser microphone will likely impress you. This is a very sensitive microphone that is capable of picking up even soft audio. Despite its sensitivity, it is also very good at eliminating feedback. You will not have to worry too much about problems with distortion when you make use of this microphone. One of the most noteworthy aspects of this microphone is just how rugged it is. This is something that is built to last, and you will potentially be able to use this microphone for many years. It will be able to withstand some dings without giving you any problems, but you should still be careful with it. Treating the microphone with care will ensure that it will be a reliable tool for you for many years to come. This condenser microphone has a very wide and flat frequency response. It makes it the perfect candidate for helping you to pick up and record instruments. Acoustic instruments will work great when paired with this microphone. You’ll be able to use it as an overhead microphone, a piano microphone, and much more. It will prove to be very useful for any musician who wants to record instruments. You can enjoy noise-free transmission with this microphone. It has a cardioid signature that works perfectly for capturing the right sounds and keeping out background noises. There is a reason that this has become such a popular option for studio musicians. Keep it in mind if you are in need. One alternative that is worth considering is going to be the Rode NT1-A. This unit is very capable as a condenser microphone and will work perfectly in the studio. It comes with many extras that the Behringer C-1 does not. For example, it comes with a studio-grade pop shield that will prove to be useful. If you are in need of extra accessories like this, then it may wind up being a better value. The Behringer C-1 is substantially less expensive than this microphone, though. The performances of the two microphones are close enough to make it a tough call. If you want to save money, then the Behringer C-1 is the way to go. Otherwise, this Rode NT1-A is a very competent microphone that comes with handy accessories. 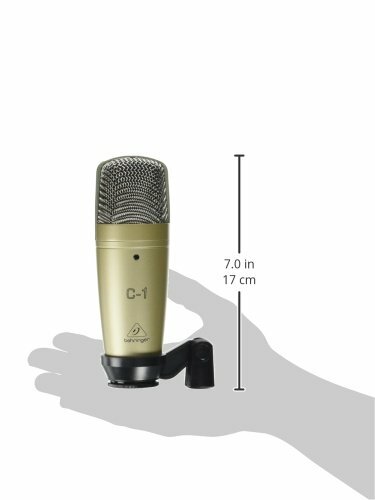 You should definitely keep the Behringer C-1 in mind if you are in need of a high-quality studio condenser microphone. It will work well for your needs and can make recording songs easy. You will get the best sound out of the microphones every time, and the price of the microphone is very reasonable. Anyone who records music or other types of audio will be able to use this microphone very well. Whenever you are in need of a durable and high-quality microphone, you will want to turn to the Behringer C-1. Its cost-effective nature combined with its impressive features makes it a worthwhile purchase. It has the right mixture of value and features. It’s useful for both professionals and amateurs who are wishing to record audio.